Hi all. Hope your having a nice evening and starting to feel weekendish.. 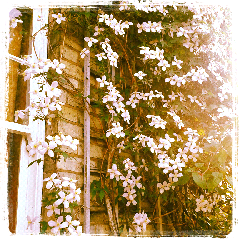 I just wanted to share this pic with you all of my lovely clematis rambling up the wall of the haven. So pretty like little stars popping out. Some garden inspiration for the wknd if you can tear yourselves away from the tennis... Have a good wknd.